Sit back and relax as the Island Style slots soothe you with colorful symbols of the tropics, and the opportunity to win major 3-reel slots jackpots. Click here to play! There's nothing to worry about when you are lying on a tropical beach, sipping cocktails at the edge of a jungle, with the sounds of toucans in the background. 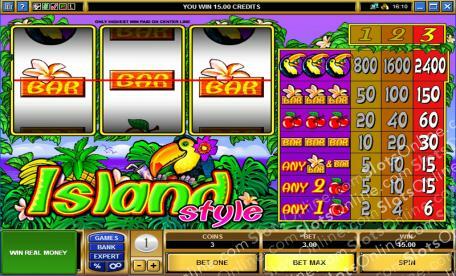 If you've had a long hard week at work, why not wind down with the Island Style slots? They are simple and exciting to play, giving you the chance to win up to 2,400 coins if you make a maximum bet. There are few things more relaxing than tropical themed slots when you cannot make it to the beach, and the Island Style slots will leave you with the same pleasant glow if you start to win big money on them. Autoplay can be set for up to 500 spins. It may also be set to stop when a jackpot is won, on any win, on a win of a certain amount, or if credits increase or decrease by a certain amount.